The results are in for our pre-election questionnaire of political parties. See our summary of where Labor, Liberal, Greens and Family First stand on key environmental issues. On March 7, Premier Jay Weatherill and Opposition Environment Spokesperson Michelle Lensink featured at our Environment Forum - 2014 State Election. The politicians answered questions asked by the packed-out audience on important topics including marine parks, climate change, fracking, genetically modified crops and biodiversity protection. For more on where the political parties stand on SA's most important environment issues, read our summary comparison of their policies and commitments, and our response. ConservationSA is giving the community the opportunity to show they value the South Australian environment, and that they expect their political leaders to do so too - through adequate funding and effective policies. 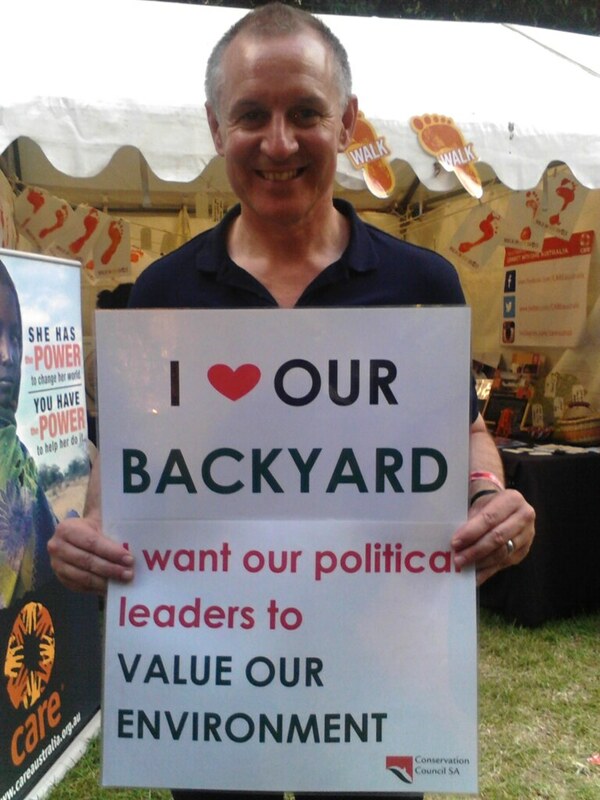 Our photo campaign at our WOMADelaide stall was a great success, getting hundreds of happy snaps of people calling on our political leaders to 'Value Our Environment'. Thank you to everyone who wrote their own personal messages and smiled for the camera over the weekend. We here at ConservationSA are looking forward to getting creative with all the images - and are planning to launch an online photo campaign soon, so watch this space. Oh, and even our Premier agrees! The Conservation Council of South Australia has today cautioned that increases to park ranger numbers will be meaningless if massive funding cuts to the Environment Department continue as planned. With the Climate Change Authority today recommending Australia significantly raises its ambition on climate change action, the Conservation Council SA is calling on all parties to make the issue a much higher priority in the 2014 South Australian election.